View of “Lutz Bacher: Magic Mountain,” 2016. IN THE BEGINNING IS THE END. That’s what I kept thinking while standing alone in 356 S. Mission’s industrial backlot amid shifting clumps of art-world denizens. The late-day golden light was fading, and wave upon wave of Biblical so-and-so begat so-and-so washed up and over us via James Earl Jones’s unmistakable voice. It was the opening night of Lutz Bacher’s Magic Mountain, an expansive installation that is one of the best things—full stop—I’ve been inside of in ages. All of the choices on display feel inevitable, unerring: complexity and clarity wandering hand in hand. Perhaps all kingdoms come to this. I was prepped to see crowns by Godfathers, 2016, a print of men in suits at a long table, doubled to form a V, that stands behind the front office’s actual table (with, yes, Chairs, 2016). These men might have been at home in the sinister Kurt Jooss ballet The Green Table, made in 1932 as Germany staggered between wars—masked diplomats dance around the table, and the deaths they decide are not their own. But there is an actual, quiet performance tucked inside the installation’s center. 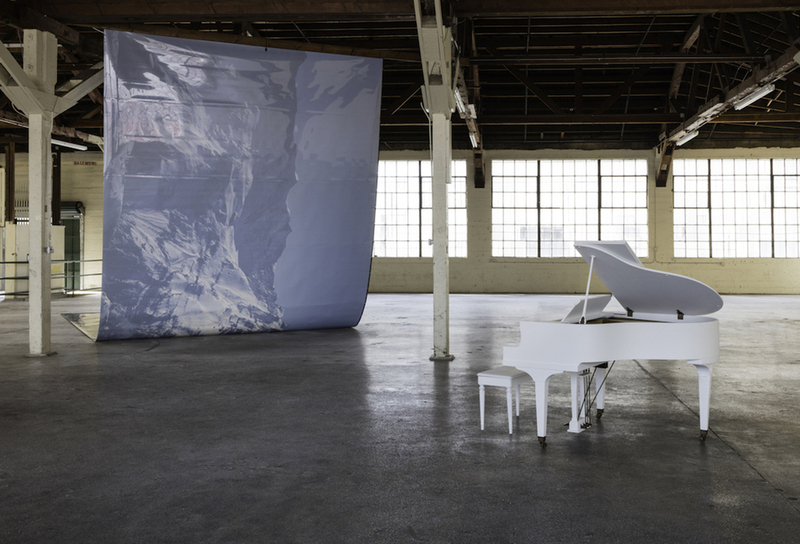 Paradise (2016): a piano, painted white, from which emanates a recording of tuning periodically punctuated by the presence of a live tuner. Someone told me the building was once a home for baby grand pianos, stacked, unbelievably, from floor to ceiling and owned, naturally, by Liberace. (If this isn’t true I don’t want to know.) For Magic Mountain, the great central chamber of 356 S. Mission is left largely empty, the better for its scale to act on visitors. 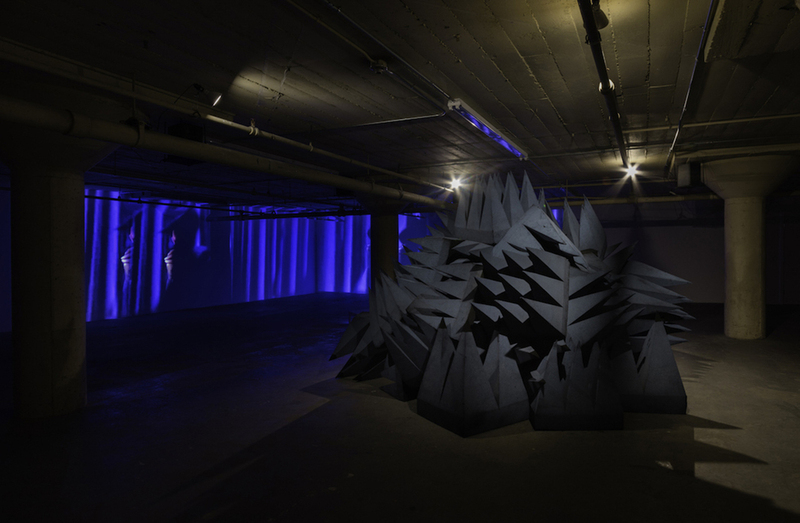 As you gaze up, over, across—at other people; at The Alps, 2015, a giant Mylar hanging of blue and white snowy crests; at Blue Infinite (Horizon), 2016, a blue chalk line running the length of the back wall—Bacher is creeping up on you via Divine Transportation, 2016, iridescent glitter coating the floor like the barest dusting of snow. In the beginning is the end. At the opening festivities, there was an outlier among the straight-out-of-central casting art-world types milling around like Hollywood extras awaiting their minutes of fame. An unkempt man, sitting quietly on the bench just outside the lot. Was he also listening to Jones? As the car I was in was pulling out of its parking space, there he was again, walking too slowly for us to figure out his path, his hair wild, his arms directing invisible forces. People are forever writing that Bacher is impossible to write about. But it seems like just the opposite (look how many ridiculous things I just wrote). Or rather the impossibility only presents itself if you assume there is ever a right way to talk about anything. Or that an artist who presents a less tricksterish public persona than Bacher is any more knowable in the end. Lutz Bacher’s Magic Mountain runs through July 31st at 356 S. Mission in Los Angeles.